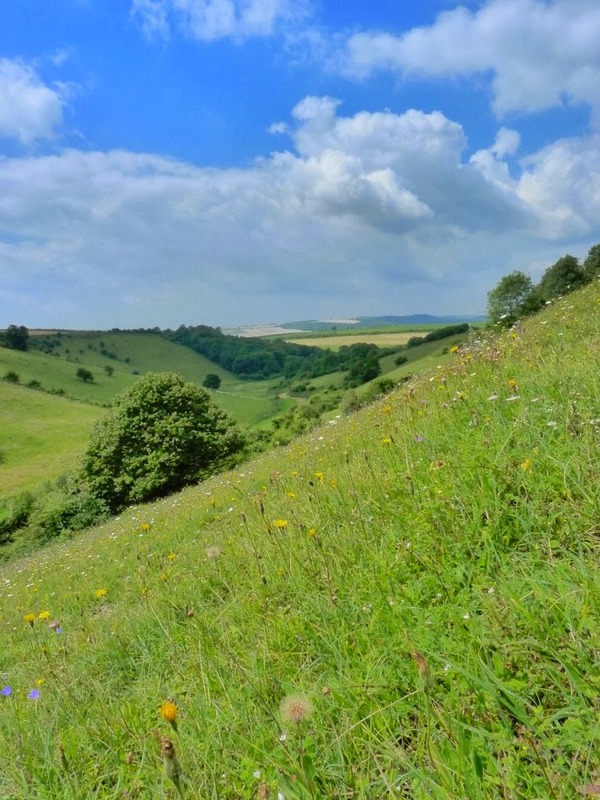 The Murray Downland Trust's reserve at Heyshott Escarpment is known for many things, not least some of the most stunning views across West Sussex. The chalk grassland, scrubbier areas and adjacent woodland support a fantastically rich flora and fauna, making this site one of the 'jewels in the crown' of the South Downs National Park. One species for which the reserve has become particularly well known in recent years is the endangered Duke of Burgundy butterfly. The following article is reproduced from the Murray Downland Trust Seventeenth Annual Report (2011). 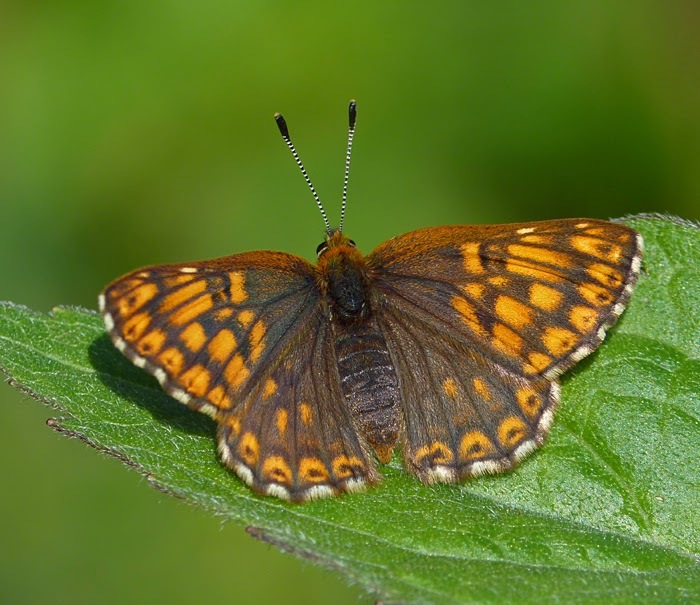 It gives real hope that, by working in partnerships such as that forged between the Murray Downland Trust and Butterfly Conservation Sussex Branch, we can preserve this beautiful and charismatic butterfly for the enjoyment of future generations. 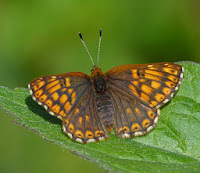 The Duke of Burgundy is one of the two most rapidly declining and threatened species of butterfly in the UK, which together with the High Brown Fritillary now faces potential extinction unless conservation measures are successful in halting and reversing the current trend of population losses. Fewer than 100 colonies remain, with West Sussex being at the retreating eastern front of the species’ geographical distribution, leaving just isolated outliers in Kent. The vast majority of remaining colonies are very small, comprising no more than a handful of adult insects on the wing at any time during its late April to early June flight season. 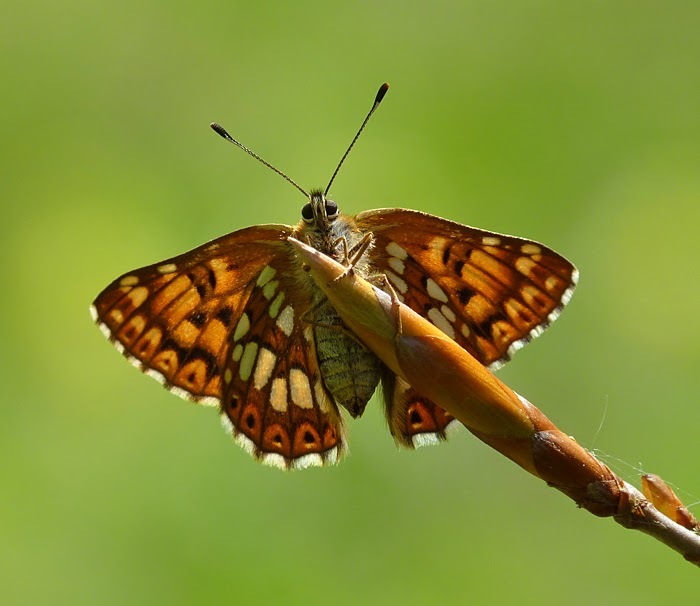 Populations where maximum daily counts exceed 30 butterflies are now very rare and in 2003 the total number of Duke of Burgundy adults seen in the county was 8. I remember Colin Pratt F.R.E.S., the county recorder, showing me a histogram depicting the number of 2 Km squares occupied by ‘the Duke’ since the 19th Century; extrapolation of the ever-downwards trend clearly suggesting that the species was unlikely to outlive the second decade of the 21st Century in Sussex. This is a butterfly in dire straits. The Duke of Burgundy is the flyweight champion of the butterfly world, being so pugnacious that all other species are attacked should they stray across the male’s fiercely guarded territory, irrespective of their size. He is only as large as one of the blue family. The males will often congregate in small ‘leks’ where in-fighting is almost constant between the hours of 11am and 3pm. Although he can occasionally be seen outside these hours ‘the Duke’ is very lazy, rising late and retiring early. Combatants typically spiral upwards in vertical climbs of up to 50 metres before dropping back to their eagerly contested perches on low scrub. The females are better behaved and go about their business of laying eggs as discreetly as possible. These are deposited singly, or sometimes in twos and threes, on the underside of cowslip leaves, or on primrose in more wooded habitats. She is notoriously fussy about her selection of egg-laying sites, this being a critical issue to which I will return. The sexes are broadly similar in appearance, with a network of dark bars and stripes over a ginger-brown base colour, giving the general appearance of a fritillary; indeed this was once called the Duke of Burgundy Fritillary. However, the taxonomists now place this butterfly in a family of its own, at least in the UK, although there are relatives living abroad. At home ‘the Duke’ is unique in that the male has vastly reduced front legs and uses only the rear two pairs for walking, whereas the female has all six legs fully developed. 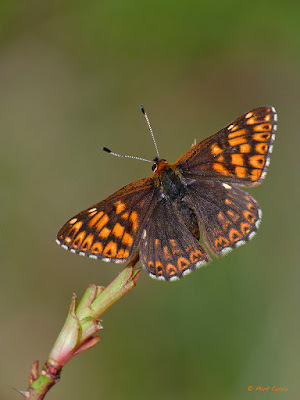 In West Sussex there are now less than a dozen sites supporting the Duke of Burgundy and many of these could be lumped together, leaving just 5 population centres. I personally began to work in earnest on ‘the Duke problem’ in 2005, but it was April 2007 before I met up with Bruce Middleton and Butterfly Conservation’s SE Regional Officer Dr Dan Hoare on the slopes of Heyshott Escarpment. At the time the population here had hung on by its fingernails for many years, with maximum daily counts of just 2 or 3 insects at the small ‘lek’ within Compartment 10. Although the management of the reserve at that time suited most of the flora and fauna, it was not quite right for ‘the Duke’. 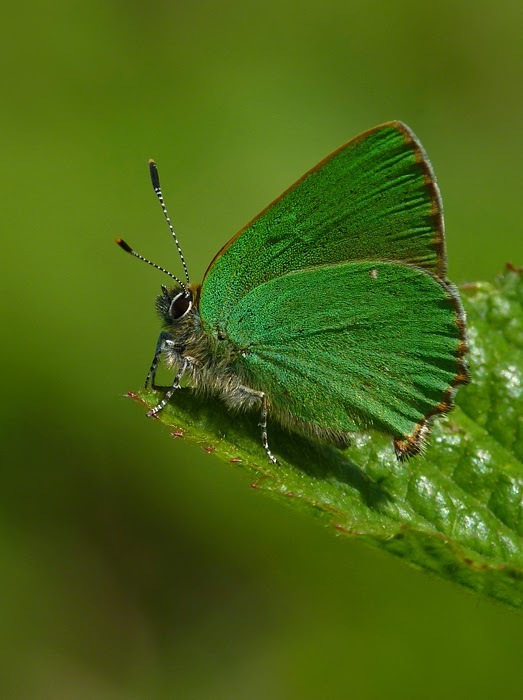 Since then the Murray Downland Trust and Butterfly Conservation Sussex Branch have worked very closely together in improving things for this species. Sometimes conservation necessitates that we rob Peter to pay Paul and it is difficult to please all of the plants, invertebrates and those further up the food-chain all of the time. However, the MDT project team led by Mike Edwards has done a fantastic job in doing just this, although it is of course vital that ongoing monitoring gives early warning of any disadvantageous changes in the other valuable inhabitants of this wonderfully diverse site. At the moment everything seems happy, while the results achieved so far for the Duke of Burgundy have been nothing short of remarkable. As changes in the habitat management took effect maximum daily counts began to rise; 7 and 8 in 2008 and 2009, then leaping up to 51 in 2010 and a mighty 115 this spring (2011). It is rare for the term ‘population explosion’ to be applied to this butterfly and these figures buck the national trend, proving that the decline can be reversed where focused efforts are made to satisfy its highly fussy needs. Similar results have been achieved on another Sussex site over the same time period. There are other winged beneficiaries too, as nationally declining species such as the Dingy Skipper are doing exceptionally well here. This butterfly also prefers that seemingly awkward ground between early and mid succession habitats. And there’s the rub. It is only by targeted management that some species with very particular requirements will thrive. It is these species which unfortunately often suffer (and sometimes go extinct) at the hands of a one-size-fits-all philosophy for managing ‘whole habitats’ such as calcicolous grassland. It is due to the care and attention to detail given to the MDT management plan that these tricky species are doing so well, alongside thriving populations of their less demanding neighbours. So what is it that makes life so difficult for the Duke of Burgundy, whose food-plants are so widespread across superficially suitable tracts of our landscape? As always with these species the devil is in the detail. The cowslips must be in the correct growth form and in a precisely suitable position for the fussy ‘Duchess’ to consider leaving one or two of her pearly, pale green eggs behind. Leaves that are medium or large sized, fleshy and semi-erect are strongly preferred and these are often found where slightly longer swards are developed, often in the shade of taller scrub or trees, or where ‘soft’, advancing, low scrub edges are to be found. Turf which is over-grazed by the more familiar breeds of sheep soon becomes unsuitably short and tight, hosting only small cowslips with tiny leaves pressed close to the ground in fear. The situation only becomes worse when the rabbit follows with enthusiasm. Scrub cutting must be truly rotational, as continually cutting to the same template soon creates ‘hard’, unsuitable edges. Nearly right is not good enough for this butterfly. Of course Heyshott Escarpment is not just about the Duke of Burgundy. It’s a fabulous place to visit at any time of the year, with views from the upper levels which are hard to beat anywhere within our National Park. But springtime is the time to be here, when the early orchids are in flower and ‘the Duke’ is on the wing. The supporting cast is strong, including Dingy and Grizzled Skippers, Brown Argus, Common Blue and the Green Hairstreak, a butterfly so exotically green that it would not look out of place in a South American rainforest. As winter approaches I look forward to joining MDT and BC Sussex volunteers on the reserve, where there will be much to do if the exciting plans for this coming work party season are to be completed. This will make even more room for, amongst other things, this charismatic little butterfly. 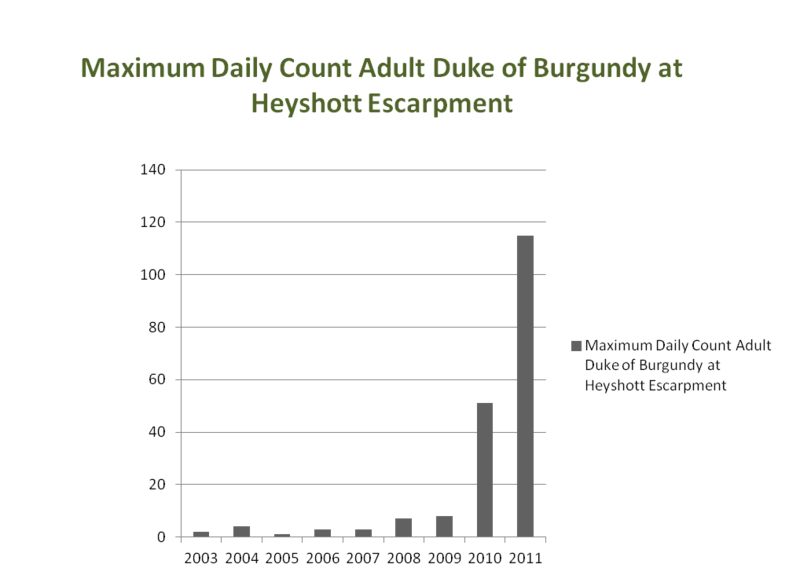 Heyshott Escarpment has already achieved a position amongst the very best Duke of Burgundy sites in the UK. Only time will tell just how good it can get. 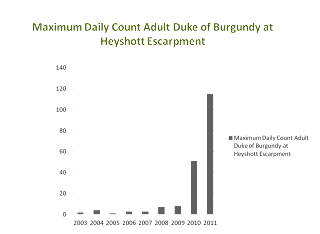 FOOTNOTE: Duke of Burgundy numbers fell back significantly during the spring of 2012, as they did on the majority of sites. This was undoubtedly due to the exceptionally adverse weather suffered throughout the flight season. However, clear signs of recovery were observed in 2013 and we will hopefully see the population grow further over the next year or two.